This was Mick Jagger's first solo album, coming out in the middle of The Stones lowest period. Basically, give or take a few synthesisers, it is made up of the sort of material that Jagger would contribute to Stones albums in the eighties. Stick this on with Keith Richards' 1988 "Talk Is Cheap", put it on "shuffle" and you have yourself an eighties Stones album. Many of Jagger's friends appear on the album - Nile Rodgers, Peter Townshend, Jeff Beck, Herbie Hancock, Ray Cooper, Sly Dunbar, Robbie Shakespeare and Chuck Leavell. The musicianship is obviously quality, but it is still very "eighties". For that reason, I don't listen to it too often, I have to admit. It has that feeling of being "just another eighties album". "Lonely At The Top" is a very 1985-sounding rocker, with the obligatory synthesiser riffs and a hint of "Footloose" about it. As with all the material on this album, it sounds Stonesy in that Jagger is singing, but with a bit more of a poppy, polished, some would say soulless production. "1/2 A Loaf" could easily have come from "Dirty Work" from the following year. It has that mid-pace, seductive Jagger-rock sound to it. "Running Out Of Luck" is a slightly unmemorable eighties chugger, with a vaguely funky beat. "Turn The Girl Loose" has an infectious beat, but again there is too much synthesiser, the blight of all albums from this period. Jagger's vocal is in the "Undercover" album vein. I can't really describe it, sort of quirky, hiccuppy, semi-slurred in places. You know it when you hear it. "Hard Woman" is one of those seductive Jagger rock ballads that appeared during this period and were still turning up on Stones albums twenty years later on "A Bigger Bang" (I'm thinking of "Streets Of Love"). The song has a sort of Jagger-ish majesty about it though. "Just Another Night" is a catchy number but once more is very much of its time. The problem with songs like this is that I feel they would have been so much better with a full-on Stones backing. "Lucky In Love" has a welcome bassy thump to it and is one of the album's better tracks. It is probably my favourite on here. "Secrets" has a poppy but dance-ish feel to it, as indeed does most of the album. It is actually quite an appealing number. 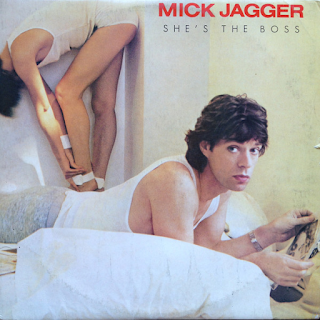 "She's The Boss" has an eighties disco riff and a sort of Talking Heads feel to it in the chorus and funky-ish parts. I have summed up this album pretty much in the earlier paragraphs. It is ok, but it rarely gets a play. That must tell you something.